BLOOMINGTON – Luke Griner had been in this position before. But he had never been in this position before. Sprinting all out, heading up the final backstretch and trapped in a box at the state finals. It wasn’t a comfortable spot for the Wawasee sophomore. “I knew that was my only chance. I had to. So I moved into lane four and passed them all,” said Griner, in between gasps of air, after finishing ninth in the 800-meter run at the IHSAA boys state track finals Friday night. It’s not just that Griner clocked the fastest time of his life … 1 minute, 55.49 seconds. And it’s not just that he had to run in a “slow” heat at the Indiana University track in Bloomington. The simple fact is: with 300-meters to go, he looked totally out of it. But with 100-meters to go, he was battling for the lead. Talk about a gutsy move. 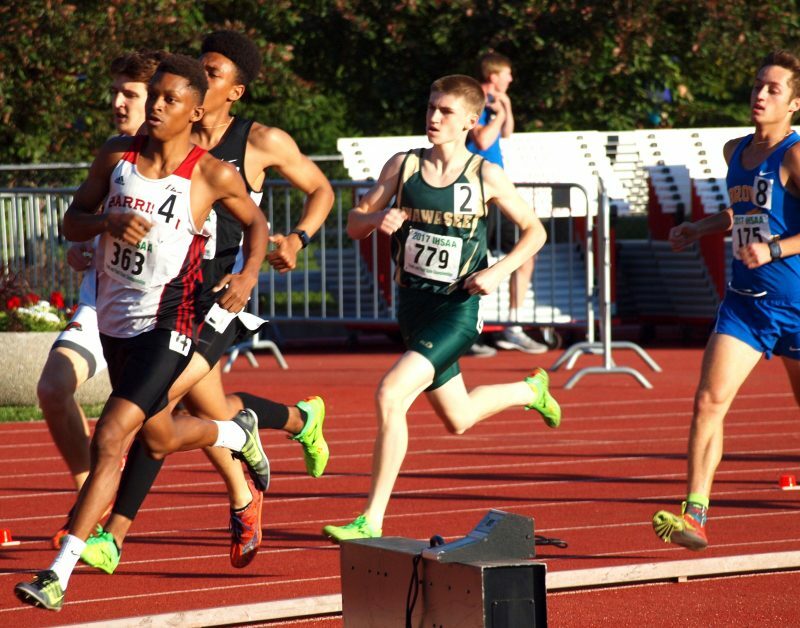 Seeds at the state finals are based on regional performances, and even though he ran well at the Kokomo regional, Griner found himself in the first section of the 800 at state. That meant that he had to run an exceptional time to knock out somebody from the “fast” heat. Mission accomplished, as Griner swung wide and unleashed a surge that carried him past seven other competitors in the space of 100 meters on the final lap. He battled Huntington North’s Elijah Chesterman down the homestretch, eventually finishing second in his heat. But good enough for ninth overall. Warsaw’s season came to an end in unexpected fashion as the Tigers failed to score a point in this boys meet. But then, that seemed to be the case for most northern Indiana teams this year. Hard to believe, but there wasn’t a single qualifier at the boys state meet from either the city of South Bend or Gary. And for the first time in anybody’s memory – possibly ever – the entire Northern Indiana Conference was shut out, failing to place in any event. The most successful area competitor was Plymouth’s Nate Patterson, who cleared 6 feet, 10 inches to win the high jump. Carmel claimed its third consecutive boys state championship, scoring 69 points to turn back Avon (47) and Indianapolis North Central (43). Warsaw’s 4 x 100 relay squad had the team’s best performance. Rane Kilburn, Will McGarvey, Alijah Wade and Tristan Larsh clocked 42.86 seconds to finish 13th overall. The 4 x 400 relay, meanwhile, settled for 21st overall. Kilburn, Keagan Larsh, Ridley Lemon and Wade came home in 3:25.28, which was still a step better than arch-rival Penn (3:26.09). Zeb Hernandez placed 20th in a loaded 1600-meter race, clocking 4:26.58. In the 200-meter trials, Tristan Larsh clocked 22.36, which is pretty fair, but it left him seven places out of the finals. Tippecanoe Valley’s Dakota Parker clocked 51.02 to finish 24th in the 400-meter dash. 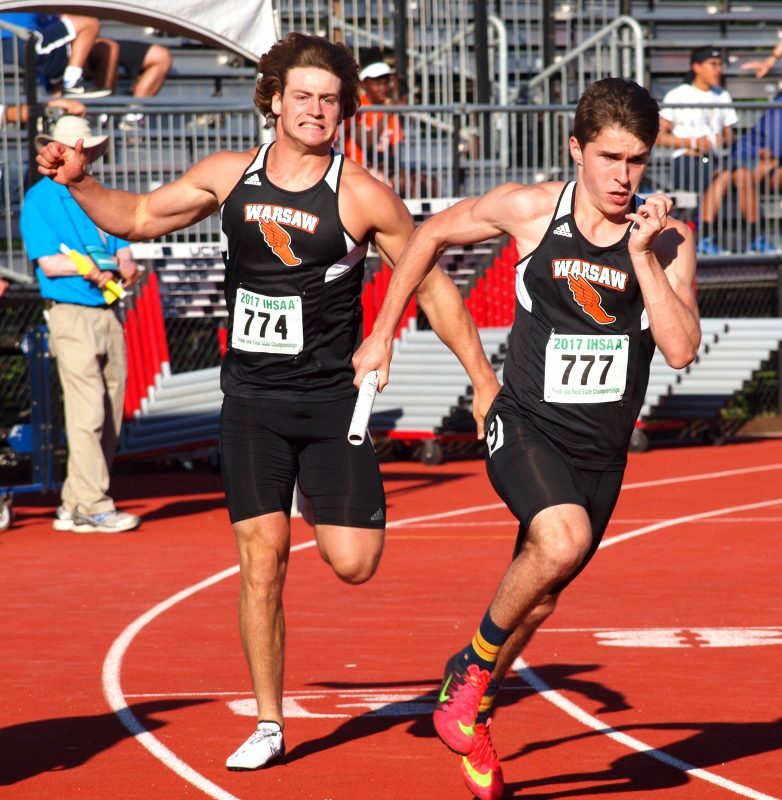 Will McGarvey hands the baton to Alijah Wade for Warsaw during the 4 X 100 relay. Team scores (TOP 15): Carmel 69, Avon 47, Indianapolis North Central 43, Chesterton 37, Fort Wayne Northrop 32, New Palestine 26, Center Grove 23, New Palestine 26, Center Grove 23, Evansville Harrison 22, Bloomington North 21, Warren Central 20, Portage 18, Carroll (Fort Wayne) 16, Westfield 14, West Lafayette 13, Pendleton Heights 13, Western 13. Other area: Plymouth 10 … Northridge 2 … Wawasee 1 … Goshen 6/10. 4 x 800 relay: 1, Carmel (Jon Balda, Trey Harris, Eli Konow, Kenji Tomozawa) 7:43.65. 2, New Palestine 7:44.20. 3, Fort Wayne Northrop 7:47.29. 4, Westfield 7:48.37. 5, Fishers 7:48.88. 6, Indianapolis North Central 7:49.66. 7, Jasper 7:49.93. 8, Zionsville 7:50.42. 9, Terre Haute South 7:51.07. Other area: 23, Northridge (Tanner Sallee, Noah Detwiler, Andrew Kauffman, Logan Riffell) 8:11.42 … 26, Elkhart Central (Christian Taylor, Adam Delks, Elias Soto, Luis Perez) 8:14.18. 110 high hurdles: 1, Daveon Finley (Portage) 13.77. 2, Shaton Vaughn (FW Northrop) 14.16. 3, Kaleb Budde (Bloomington So) 14.23. 4, Tyler Ettel (Providence) 14.24. 5, Tremaine Gonzalez (Silver Creek) 14.36. 6, Christian Goines (Center Grove) 14.42. 7, Daryl Black (Indianapolis Pike) 14.44. 8, Bryce Birdsong (Warren Central) 14.56. 9, Stacen Cunningham (Evansville Reitz) 14.95. Other area (trials): 21, Kenny Kerrn (Jimtown) 15.21 … 22, Jacob Stump (NorthWood) 15.22 … 23, Seth Mackowicz (Mishawaka) 15.23. 100: 1, Noah McBride (Evansville Harrison) 10.55. 2, Ryan Lipe (Carmel) 10.61. 3, Isaac Guerendo (Avon) 10.68. 4, Grant Mason (Center Grove) 10.72. 5, Justin Becker (Carroll-Fort Wayne) 10.72. 6, Braden Corzan (Chesterton) 10.81. 7, Isaiah Ware (Indianapolis North Central) 10.82. 8, Noah Malone (Hamilton SE) 10.83. 9, Craig Young (Fort Wayne Wayne) 37.32 injured. Other area (trials): 18, Andy Doty (Penn) 11.05 … 20, JT Webb (Elkhart Central) 11.07 … 27, Wisdom Chigwada (Elkhart Memorial) 11.40. 1600: 1, Gabe Fendel (Hamilton SE) 4:04.70. 2, Matthew Schadler (Evansville Reitz) 4:13.31. 3, Richmond Stoltzfus (Westview) 4:13.37. 4, Cole Hocker (Indianapolis Cathedral) 4:13.58. 5, Parker Jones (Pendleton Hts.) 4:14.84. 6, Josh Everetts (Western) 4:15.54. 7, Brooks Long (Southmont) 4:15.55. 8, Jesse Hamlin (Fort Wayne Snider) 4:16.77. 9, Justin Niederhaus (Princeton) 4:17.25. Other area: 20, Zebediah Hernandez (Warsaw) 4:26.58. 4 x 100 relay: 1, Carroll-Fort Wayne (Justin Becker, Jordan Schmeling, Cameron Shank, Connor Tapp) 41.06. 2, Avon 41.20. 3, Chesterton 41.45. 4, Warren Central 41.66. 5, Lake Central 42.01`. 6, Carmel 42.12. 7, Ben Davis 42.23. 8, Evansville Harrison 42.28. 9, Center Grove 42.35. Other area: 13, Warsaw (Rane Kilburn, Will McGarvey, Alijah Wade, Tristan Larsh) 42.86 … 15, NorthWood (Landon Parker, Terrell Pratcher, Garrett Griffin, Brayton Yoder) 42.98 … 17, Elkhart Central (Bernard Gilbert, JT Webb, Desmond Johnson, Adam Moon) 42.99 . 400: 1, Isaiah Ware (Indianapolis North Central) 47.91. 2, Sean Johnson (Cascade) 48.71. 3, Spencer Gudgel (Carmel) 48.78. 4, Matt Marcus (Munster) 49.05. 5, James Hardin (Noblesville) 49.10. 6, Peyton DePriest (Avon) 49.14. 7, Brett Lemmons (Morgan Twp.) 49.20. 8, Ben Zuercher (Northridge) 49.22. 9, Lucian Anderson (Indianapolis Cathedral) 49.35. Other area: 24, Dakota Parker (Tippecanoe Valley) 51.02 … 26, Harold Moon (Concord) 51.34. 300 intermediate hurdles: 1, Shaton Vaughn (FW Northrop) 37.45. 2, Jalen Walker (Carmel) 37.91. 3, Cole Maguire (Indianapolis North Central) 38.33. 4, Trevor Hohlt (Center Grove) 38.69. 5, Michael Tutsie (Warren Central) 38.79. 6, Justin Mamaril (Westfield) 38.95. 7, Zach Daniels (FW Wayne) 38.96. 8, Dylan Felger (Norwell) 39.00. 9, Bryce Byrdsong (Warren Central) 39.05. Other area: 11, Bailey Mott (Penn) 39.35 … 24, Seth Mackowicz (Mishawaka) 41.42 … 25, Connor Kitson (Fairfield) 41.42. 800: 1, Samuel Voelz (New Palestine) 1:52.60. 2, Parker Jones (Pendleton Hts) 1:52.62. 3, Jacob Adams (Michigan City) 1:53.02. 4, Jalen Royal (FW Northrop) 1:53.25. 5, Madison King (Avon) 1:54.59. 6, Elijah Chesterman (Huntington North) 1:54.92. 7, Mitchell Curl (West Lafayette) 1:54.98. 8, Chandler McGaha (Franklin) 1:55.43. 9, Luke Griner (Wawasee) 1:55.49. Other area: 19, Zach Oyer (Goshen) 1:59.49 … 26, Brady Willard (Fairfield) 2:04.41. 200: 1, Noah McBride (Evansville Harrison) 21.14. 2, Ejiroghene Biokoro (Chesterton) 21.55. 3, Braden Corzan (Chesterton) 21.65. 4, Grant Mason (Center Grove) 21.73. 5, Isaac Guerendo (Avon) 21.74. 6, Deangelo Mason (Lawrence North) 21.95. 7, Jordan Hodge (Warren Central) 21.98. 8, Evan Manley (Westfield) 22.13. 9, Justin Becker (Carroll-Fort Wayne) 22.89. 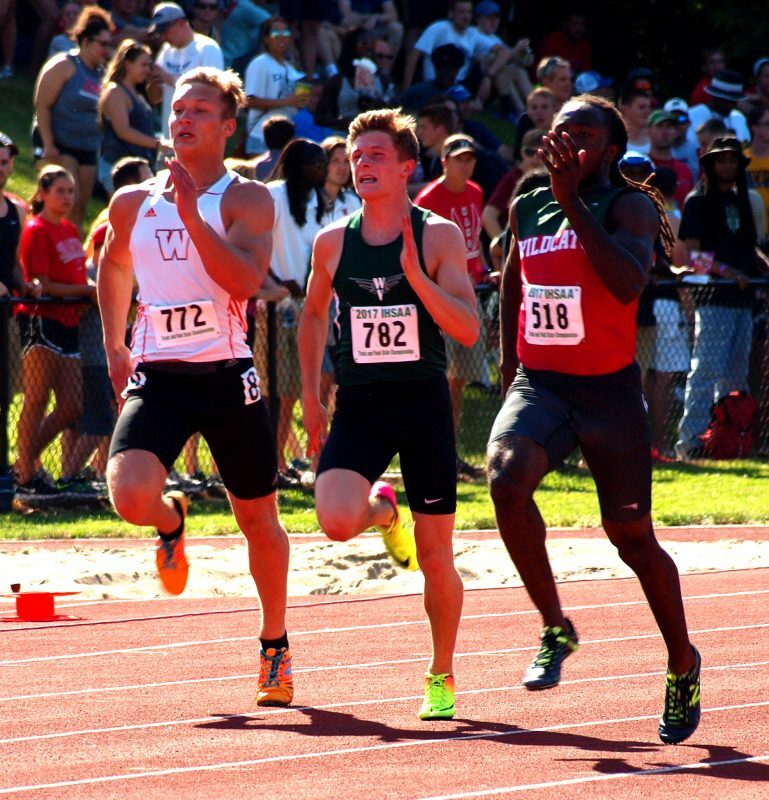 Other area (trials): 16, Tristan Larsh (Warsaw) 22.36 … 19, Andrew Doty (Penn) 22.60. 3200: 1, Curtis Eckstein (Oldenburg Academy) 9:08.54. 2, Skylar Stidham (Christian Academy) 9:09.69. 3, Ben Miller (Carmel) 9:10.74. 4, Bailey McIntire (South Adams) 9:11.42. 5, Jake Kintzele (Chesterton) 9:11.49. 6, Joshua Roth (Fishers) 9:12.47. 7, Hunter Boyer (Lowell) 9:16.78. 8, Eric Hoffman (Noblesville) 9:17.26. 9, Alec Fleming (Lowell) 9:18.47. Other area: 24, Thomas Rohr (Rochester) 9:57.88 … 25, Landon Miller (Fairfield) 9:59.76. 4 x 400 relay: 1, Indianapolis North Central (Damian Clay, Malcolm Corbett, Cole Maguire, Isaiah Ware) 3:17.79. 2, New Palestine 3:18.51. 3, Avon 3:19.13. 4, Bloomington North 3:19.37. 5, Carmel 3:19.71. 6, Zionsville 3:19.79. 7, Warren Central 3:20.27. 8, Westfield 3:20.35. 9, Fort Wayne Northrop 3:20.85. Other area: 21, Warsaw (Rane Kilburn, Keagan Larsh, Ridley Lemon, Alijah Wade) 3:25.28 … 22, Penn (Elijah Cook, John Ohlson, Colton Shail, Bailey Mott) 3:26.09 … Northridge DQ (lane violation). High jump: 1, Nate Patterson (Plymouth) 6-10. 2, Kaden Branam (Waldron) 6-8. 3, Isaac Brown (DeKalb) 6-7. 4, Tie between Keyshawn McGill (Michigan City) and Jonah Lester (Peru) 6-6. 6, Stephen Wilkerson (Princeton) 36-6. 7, Lawrence Mitchell (Indianapolis Pike) 6-6. 8, Tie between Rummel Johnson (Goshen), Brandon Eberle (Eastern-Pekin), Logan Benson (Western Boone), Alex Scharpenberg (Columbia City) and Jordan Anderson (Valparaiso) 6-4. Other area: 13, Sam Pawlak (Jimtown) 6-4. Long jump: 1, Isaac Guerendo (Avon) 24-5 ¼. 2, Antonio Villegas (Floyd Central) 24-2. 3, T.C. O’Neal (Columbus East) 22-11 ½. 4, Louie Razo (Chesterton) 22-10 ¾. 5, T’Cori Lewis (Portage) 22-9. 6, Jacob Jones (Speedway) 22-9. 7, Frankie Young III (Heritage Christian) 22-7 ¾. 8, Mitchell Burton (Columbus North) 22-5 ½. 9, Corey DuPriest (Avon) 22-3 ¼. Other area: 19, Bronson Yoder (NorthWood) 21-5 ½ … 22, JT Webb (Elkhart Central) 21-0. Shot put: 1, George Karlaftas (West Lafayette) 59-5 ½. 2, Logan Calvin (Bloomington No) 56-8 ½. 3, Joe Barnes (Brownstown Central) 56-3 ½. 4, Brett Norton (Merrillville) 55-10 ½. 5, Drew Hartmann (Noblesville) 55-4 ½. 6, Nick Ray (Hobart) 53-8. 7, Ethan Alyea (Indianapolis North Central) 53-5 ½. 8, Jack Kiser (Pioneer) 52-10. 9, Curtis Blackwell (Norwell) 52-6 ½. Other area: 16, Brock Tauteris (Goshen) 50-0 ¼.
Discus: 1, Tyler Gilbert (Western) 173-10. 2, Ryder Emberton (Whiteland) 173-9. 3, Logan Calvin (Bloomington No) 171-3. 4, Chard Muhwanga (Indianapolis North Central) 170-1. 5, Nick Ray (Hobart) 169-0. 6, Bryce Sharp (Carmel) 167-11. 7, Kack Kiser (Pioneer) 166-10. 8, Jacob Thompson (Eastside) 159-2. 9, Devin Humes (Brownsburg) 157-8. Other area: 18, Andy Wang (Goshen) 148-1. Pole vault: 1, Ryan Lipe (Carmel) 17-3. 2, Colton Crum (Frankfort) 17-0. 3, Anthony Cappola (Jeffersonville) 15-6. 4, Mitch Lipe (Carmel) 15-6. 5,Nathan Stone (Lawrence No) 15-6. 6, Jacob Ballain (Whiteland) 14-6. 7, Jacob Bondon (Portage) 14-6. 8, Jacob Coryea (Bloomington So) 14-6. 9, Tie between Sam Wood (Churubusco) and Mark Bertke (East Central) 14-0. Other area: 18, Lucas Demoya (Goshen) 13-6. Trey Zahner (Penn) NH. Tristan Larsh (far left above) competes in the 200 trials for Warsaw.